All of our systems now including our remote models are all pre-assembled with all fittings epoxy sealed for ease of installation and a more reliable unit. No more connecting hoses hoping there are no leaks. If you have any questions on this improvement please give us a call..
Engine Compartment in GMC and others– This auto deploy system is charged with 2 liters of foam and nitrogen as a propellant. 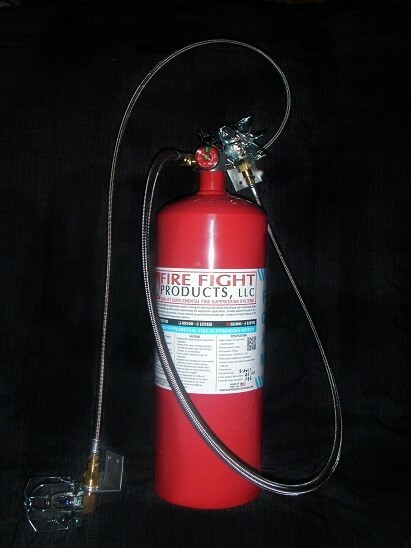 Designed specifically for the engine compartment in the vintage GMC motorhome, is also a perfect automatic fire suppression system for other smaller engine compartment vehicles to include generator compartments. With its remote from the cylinder head and a 4′ Teflon lined braided stainless hose (for GMC Motorhome application), this system is versatile and effective. 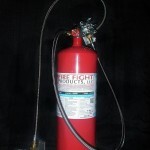 2 Liter fire extinguishant in rechargeable D.O.T. approved cylinder. 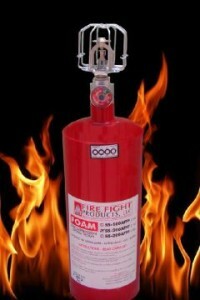 This 4 liter foam auto deploy system has 2 heads connected via one 4 foot and one 6 foot Teflon lined braided stainless steel hoses for full coverage in side radiator pusher diesel motor homes specifically. With 2 trouble areas for fire (radiator lines and diesel injectors) this unit can take care of them both. Due to DOT regulations all shipments are ground only with a minimum ship time of 1-2 weeks. Please call to order.